I have finally completed this painting, which I’ve been working on over the year. You can see its progress here. It is based upon Leda and the Swan , the ancient Greek myth of Zeus disguised as a swan who seduces the innocent mortal Leda. I wanted an African nuance, but ethereal too, with allusions to flight and feathers; the dreaminess of Leda’s imagination as she ponders Zeus’s love…This painting was done in watercolor on my favourite Stonehenge paper, with touches of gold paint, coloured pencil and ink. I have gorgeous art prints for sale in my online shop, and the original is also for sale here. 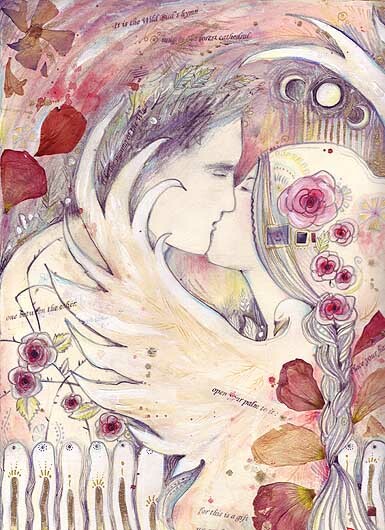 I have been experimenting again with various natural elements and media to create a wonderfully evocative painting full of the Archetypal symbolism of Love, reminiscent of the beautiful romantic paintings of Gustav Klimt and Marc Chagall. 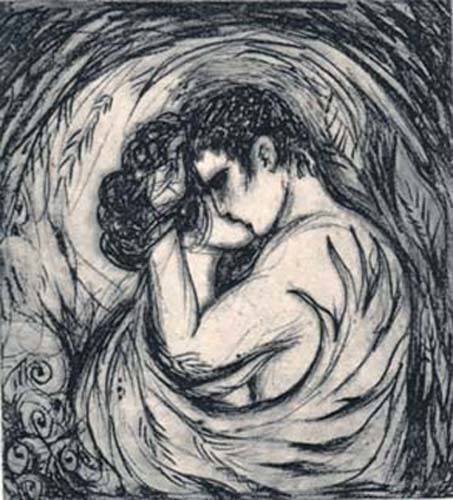 Here I explore the promises, dreams and awakening spirituality associated with the profound union of a man and a woman, the merging of two kindred souls. 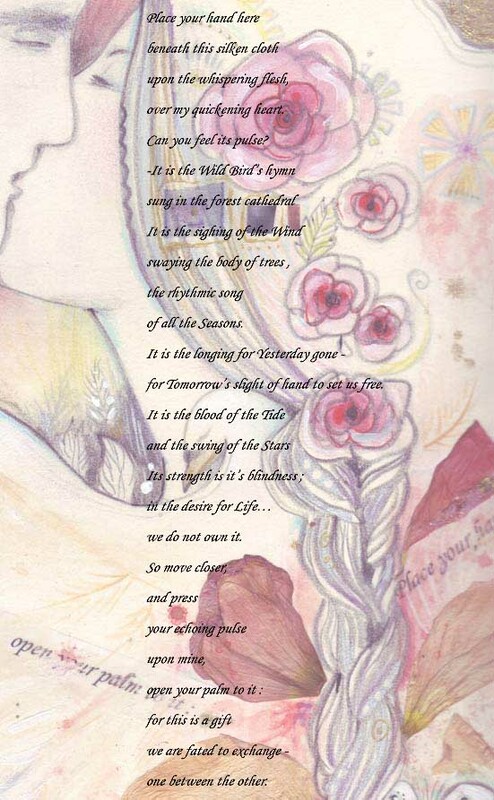 Below is a detailed image of this collage, with the poem that I wrote which is featured in the painting. This Lovers painting is available as a Limited Edition print at my shop Here: ~ I will only be making 50 prints in 7 x 10 inch size and I have the first artist’s Proof for sale. I feel that some of the more personal paintings I have done deserve to be released as small runs of limited edition prints – this means that there is only a certain number of these prints produced in a particular size – after they have all been sold no more will be ever produced. You can see more of my Lover Art if you click on the menu to the left. This was my most recent painting for Redwhisper Studio. As some of you may know, I have moved back from beautiful Australia to my homeland of South Africa. John is still running the wonderful business we created together, only he is now the captain at the helm! He is also immersing himself in his music, and you can hear a selection of his amazing original songs here. I am following my own artistic journey and will still be creating designs and paintings for Redwhisper Studio when I can. 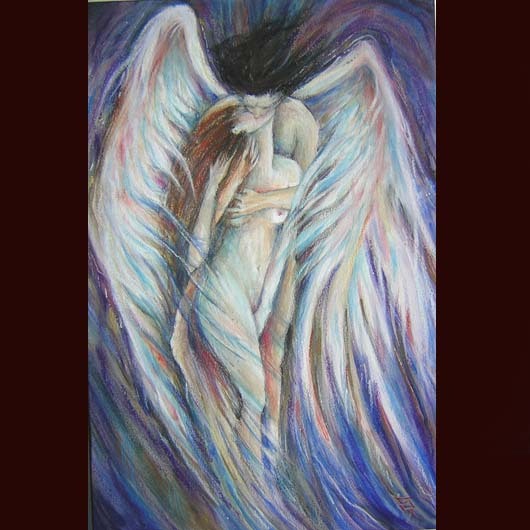 Please keep an eye on this, my website, for more of my original art, paintings, etchings, limited edition prints and jewelery designs as well as mixed media and other hand made items and ideas exploring soulful creativity, Archetype energy and the healing power of colour and symbolism. 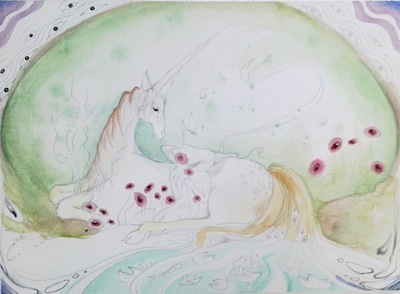 This painting explores the essence and symbolism of the Unicorn archetype: guardian of innocence, protector and bringer of courage. 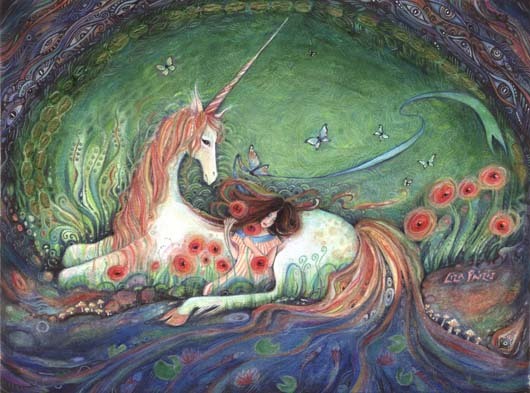 You can purchase a beautiful art print of this unicorn painting here.